Dubai, UAE, July 03, 2018: With less than 60 days to go before the closure of nomination window for the 10th Mohammed Bin Rashid Creative Sports Awards, organisers have been impressed with the number of nominations they have received until now and are confident of scaling new highs in this Year of Zayed. The nomination window, which opened on April 1, is set to close at midnight on August 31 and Her Excellency Moaza Al Marri, Secretary General of the Awards, revealed they have already received “dozens of applications in every category”. “We are really pleased with the interest and number of applications we have received thus far, and we are not surprised because the Mohammed Bin Rashid Al Maktoum Creative Sports Award enjoys a prestigious place in the world of sports,” said Al Marri. “The files we have received in these early stages of the nomination window confirm the high status of the awards and the esteem it enjoys among athletes and sports institutions, not least because the Awards carry the name of His Highness Sheikh Mohammed Bin Rashid Al Maktoum, the Vice President and Prime Minister of UAE and Ruler of Dubai. “There are still about 60 days left before the closure of the nomination window and we are confident we are going to see those numbers make a steady climb northward and up. “From our side, we are keen to give as many athletes, officials, teams and sports institutions a chance to win these awards as possible, and we are using different platforms – a dedicated smartphone application, an interactive website and regular messages through the media – to reach out to as many potential candidates as possible and facilitate their enrolment. “The smartphone applications allow nominees to open channels of communication with the organisers of the Award for technical support or to get answers to any of their queries. The MBR Creative Sports Awards is one of the richest and most prestigious awards in its category, honouring individuals, officials, teams and federations for their innovation and creativity in the world of sport, and previous recipients include the governing body of football, Fifa, the International Cricket Council and international judo and world cycling federations. Held under the banner of the Mohammed Bin Rashid Al Maktoum Global Initiatives, the MBR Creative Sports Award is the biggest of its kind in terms of categories and financial awards, and it is the first to reward creativity in the world of sports. The 9th edition of the Award had witnessed a significant increase in the number of applications – from 198 for the 8th edition to 297. The number of applicants from inside UAE rose from 72 to 87, while the number of entries from International Sports Federations climbed from 15 to 26, an increase of about 73 per cent.His Excellency Sheikh Nahyan bin Mubarak Al Nahyan was named the UAE Sports Personality of the Year in the 9th edition, while Her Royal Highness Princess Rima bint Bandar Bin Sultan Al Saud of Saudi Arabia picked up the corresponding award for Arab Sports Personality. 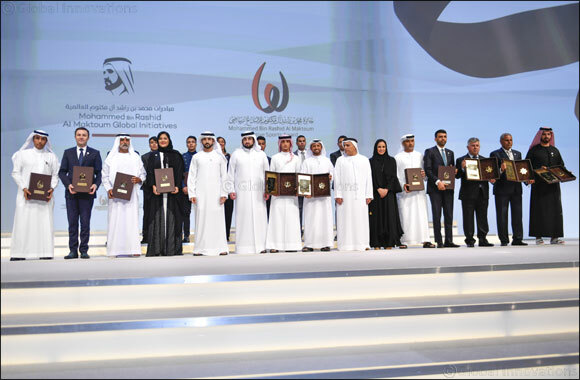 While the theme of the 9th Mohammed Bin Rashid Al Maktoum Creative Sports Award was “Empowerment of Women in Sports”, the focus for the 10th edition of the prestigious global awards is “Empowerment of Youth, the Architects of the Future”. The winners will be announced in the third week of November and they will receive their share of the prize-purse of AED7.5 million at a glittering awards function which will be held at the Dubai World Trade Centre’s Sheikh Rashid Hall on January 9, 2019. “The remarkable success of the 9th edition of the Awards would not have been possible without the guidance and generous patronage of His Highness Sheikh Hamdan Bin Mohammed Bin Rashid Al Maktoum, Crown Prince of Dubai, Chairman of Dubai Sports Council and Patron of the Awards,” Al Marri said. “This year, it is going to be even bigger because this is a special year. First, because we are celebrating this year as the Year of Zayed in UAE. Second, we are celebrating 10 years of the Awards. And then, we have two major sports events this year – the Fifa World Cup in Russia and the Youth Olympic Games in Buenos Aires in Argentina.